TP-Link's JetStream T2600G-28TS provides high performance, powerful L2 and L2+ features like static routing, enterprise-level QoS, advanced security strategies and a bundle of ISP features. The IP-MAC-Port Binding (IMPB) and Access Control List (ACL) functions protect against broadcast storm, ARP and Denial-of-Service (DoS) attacks, etc. Quality of Service (QoS, L2 to L4) provides enhanced traffic management capabilities to move your data smoother and faster. The OAM and DDM functions help facilitates network management. Moreover, the easy-to-use web management interfaces, along with CLI, SNMP and Dual Image mean faster setup and configuration with less downtime. 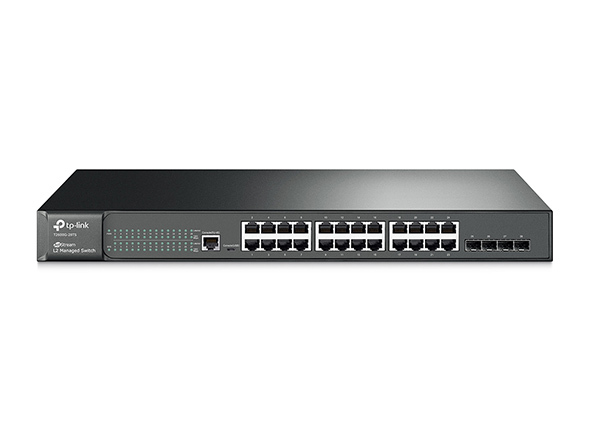 TP-Link JetStream L2 managed Switches T2600G-28TS provides a reliable, secure solution for enterprise, campus and ISP networks. 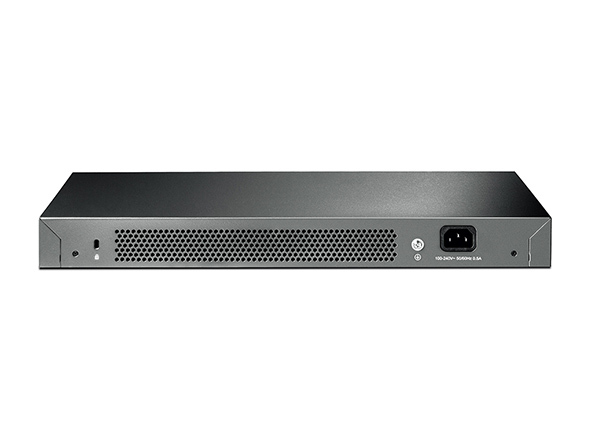 The T2600G-28TS provides IP-MAC-Port Binding, Port Security, Storm control and DHCP Snooping which protect against broadcast storms, ARP attacks, etc. It integrates some typical DoS attacks to select. You can protect these attacks more easily ever than before. In addition, the Access Control Lists (ACL, L2 to L4) feature restricts access to sensitive network resources by denying packets based on source and destination MAC address, IP address, TCP/UDP ports and even VLAN ID. Moreover, the switch supports 802.1X authentication, which is used in conjunction with a RADIUS/Tacacs+ server to require some authentication information before access to the network is allowed. T2600G-28TS supports a complete lineup of L2 features, including 802.1Q VLAN, Port Mirroring, STP/RSTP/MSTP, Link Aggregation Control Protocol and 802.3x Flow Control function. Any more, the switch provides advanced features for network maintenance. Such as Loopback Detection, Cable Diagnostics and IGMP Snooping. IGMP snooping ensures the switch intelligently forward the multicast stream only to the appropriate subscribers while IGMP throttling & filtering restrict each subscriber on a port level to prevent unauthorized multicast access. Moreover, T2600G-28TS supports L2+ feature-static routing, which is a simple way to provide segmentation of the network with internal routing through the switch and helps network traffic for more efficient use. T2600G-28TS supports a bundle of ISP features such as 802.3ah OAM, DDM, sFlow, QinQ, L2PT PPPoE ID Insertion, IGMP authentication etc. 802.3ah OAM and Device Link Detection Protocol (DLDP) functions improve monitor and troubleshoot Ethernet networks, help facilitate network management.DDM(Digital Diagnostic Monitoring) function helps view the status of SFP modules inserting to the Switch and to configure alarm settings, warning settings, temperature threshold settings, voltage threshold settings, bias current threshold settings, TX power threshold settings, and RX power threshold settings. T2600G-28TS series support various IPv6 functions such as Dual IPv4/IPv6 Stack, MLD Snooping, IPv6 ACL, DHCPv6 Snooping, IPv6 Interface, Path Maximum Transmission Unit (PMTU) Discovery and IPv6 Neighbor Discovery, which guarantees your network is ready for the Next Generation Network (NGN) without upgrading your network equipment.